Pleasanton’s boys basketball team earned its first district title since 2011 as it defeated La Vernia 69-55 on the road on Feb. 5. 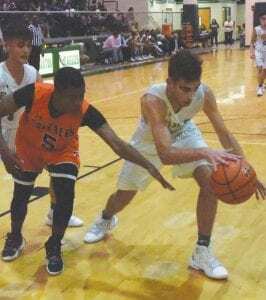 The win gave the Eagles (27-3, 10-0 District 4A- 30) a 2-0 series edge with the Bears, ensuring the tiebreaker for the district title as they hold a twogame lead in the district with two contests left. The Eagles led 35-26 at halftime. Pleasanton, which is ranked 17th by the Texas Basketball Coaches Association, has its highest win total since 1990. The Eagles overcame a challenging first half to beat Gonzales 86-44 at home on Feb. 1. Gonzales used its speed to get into the halfcourt quickly, preventing Pleasanton from using its full-court press defense during the first half. Pleasanton led 16-10 at the end of the first quarter. Midway through the second quarter, the Eagles started to break away with a 9-0 run in which Dalton Hobbs picked a steal and made two layups. That enabled a 31-17 Pleasanton halftime lead. Pleasanton went on a 22-6 run in the third quarter to put the Apaches away. Santiago Arguijo had his second straight game with 23 points. Hobbs finished with 18 points. Kade Loeffler had 13 points. Kameron Parks had 12 points. The Eagles have a promising chance of a perfect district run, finishing the season at Cuero (8-14, 4-5 District 4A-30) on Feb. 8 and at home against Navarro (2-22, 2-8 District 4A-30) on Feb. 12.